The diamond(rhinestone) on the link makes your smart watch look more fashionable. Simply remove the folding clasp to resize the band. No tool is needed. Material: High quality stainless steel metal not an inexpensive zinc or aluminum alloy make it a sleek daily companion. Suitable for 5.5-8.1 inch wrists. Design: Slim and elegant to compliment a slender wrist, this Apple Watch band 38mm is set with rhinestones that sparkle. 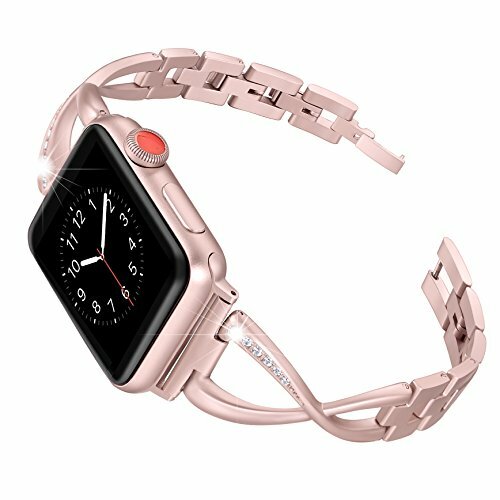 Iwatch bands 38mm womens will give your look a big boost with its thin and airy appearance. EASY TO RESIZE: Six folding clasps in each band mean a perfect fit for maximum comfort. Simply remove a folding clasp to resize the band, no tools needed! Compatibility: Fits all Apple Watch models including Apple Watch band 38mm Series 3 (2017), Series 2 (2016), and Series 1 (2015) making it a great gift for Apple Watch lovers. If you have any questions about this product by Secbolt, contact us by completing and submitting the form below. If you are looking for a specif part number, please include it with your message.